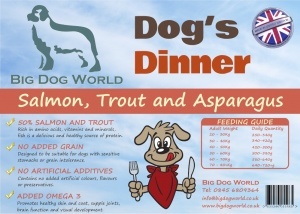 Dog's Dinner with Salmon; Trout; Sweet Potato and Asparagus is a delicious recipe that your dog is sure to love. With 50% fish content and added Omega-3 for healthy coat and joints. Many animal nutitionists believe grain is not part of a dog's natural diet. Their teeth and digestive systems are not suited to breaking down and digesting grains such as maize, corn and wheat. Opinions vary on whether dogs are carnivores or omnivores but they clearly possess a natural carnivorous bias. Therefore a diet rich in meat or fish is obviously preferable. There's great variety in the Big Dog World grain free range so we can change our Golden Doodle's food regularly, knowing that he'll like it and it will be fine for his health and digestion. My dog loves the Dogs Dinner range. Ordering is simple, Delivery is very prompt and courteous. What's not to love.